What the deuce is a differential and why does your car need one? And when it goes bad, how easy is a differential to repair? A differential is the mechanical device that divides the engine torque and allows each output to spin at a different speed. There are front-wheel-drive differentials, rear-wheel-drive differentials and all-wheel-drive differentials. Because the wheels on a car sometimes spin at different speeds and move slightly different distances when turning, a device is needed to allow each to rotate at a different speed (hence the name “differential”). A differential also provides the final gear reduction that slows the rotational speed of the transmission before it reaches the wheels. Repairing a differential isn’t a simple task. You have to have the right kind of tools, including specific gear and bearing pullers, calipers, micrometers, rubber mallet, sledge hammer, pry bar and a complete set of socket wrenches. And you will need a setup to lift the car off the ground so you can get to the differential, usually on the rear axle. After you drain the oil from the differential, you have to disconnect the drive shaft, remove the differential cover and the axles. Then you must remove the carrier caps with the pry bar. 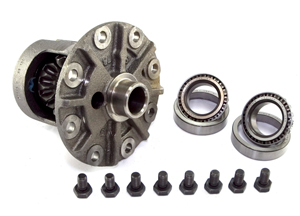 You may also have to remove the ring and pinion or pinion bearings. And if the repair requires you to remove the carrier bearings, you will need to use a bearing puller. Now you can inspect all the gears, bearings and seals, replace whatever is worn or chipped and put the whole thing back together. Or you can call the professionals at Denver Transmission and let them to the repair right the first time. The mechanics at Denver Transmission can accurately diagnose and quickly fix differential problems, saving customers time and money.